Overview The prevalence of AAA sharply increases with age. Rupture is associated with a high mortality. Screening men over the age of 65 years reduces aneurysm related mortality. Patients diagnosed with small AAA should have ongoing surveillance with ultrasound and cardiovascular risk factor modification, and may be referred to a vascular surgeon for counselling about management options. Patients with indications for AAA repair should be referred promptly to a vascular surgeon. Overall mortality of 80–90%. Rupture into the peritoneal cavity is usually rapidly fatal, whereas retroperitoneal rupture may transiently stabilise, providing a window of opportunity for lifesaving intervention. 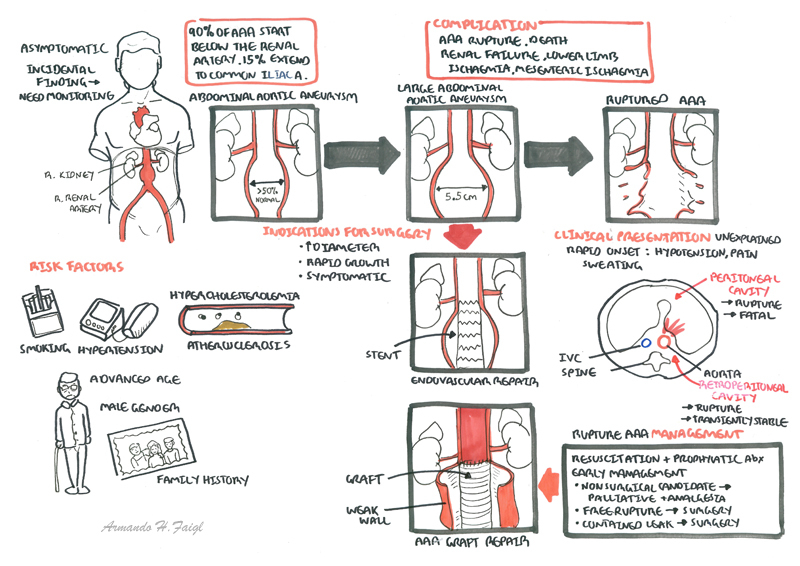 Patients should be transported to a vascular surgical centre immediately, and hypotensive resuscitation instituted to prevent excessive blood loss. Nevertheless, the majority of patients die before arrival at a surgical centre.